Chelsea Ladies have signed Republic of Ireland international Niamh Fahey from Women's FA Cup holders Arsenal. 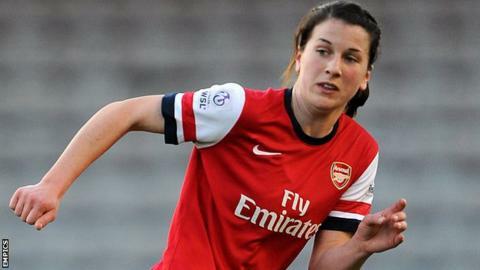 The 27-year-old central defender won four league titles and the FA Cup and League Cup four times each during her time with the Gunners. "The structure and future plans of Chelsea matched my ambitions and I'm really looking forward to getting started," she said. "The opportunity to play Champions League football was also a big factor." Chelsea pipped Birmingham Ladies to a place in the Champions League despite losing their final game of the Super League season at Manchester City. They finished second behind champions Liverpool after Birmingham were held to a draw at home by Notts County. "This is a new challenge, where I can add strength to the existing qualities I have and hopefully help Chelsea Ladies to be successful in the future," added Fahey, who has won more than 50 caps. "Niamh is one of the most underrated players in this league. Her character, winning mentality and experience sets her apart," said Chelsea boss Emma Hayes. Fahey is Chelsea's third signing since the end of the Super League season, following Doncaster Belles midfielder Millie Bright and Liverpool Ladies winger Gemma Davison.